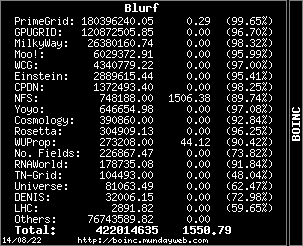 BOINC has released a new version of the BOINC client (7.6.6) which fixes a known bug causing ~3% validation errors on MilkyWay@home and other projects. Please update your clients soon to fix this issue. For more info please see my thread in number crunching here. Message 63833 - Posted: 26 Jul 2015, 22:40:00 UTC - in response to Message 63826. Message 63834 - Posted: 26 Jul 2015, 23:45:43 UTC - in response to Message 63833.
v7.6.6 is still a test version, available via the download all versions page. Message 63847 - Posted: 1 Aug 2015, 11:31:26 UTC - in response to Message 63826. Message 63858 - Posted: 8 Aug 2015, 1:43:34 UTC - in response to Message 63854. Still running 7.4.42 but upgraded to Msoft V-10 on two PCs. Both use i5 Intel processors. One runs 32-bit; the other 64-bit OS. The 32-bit machine runs only seti@home. The 64-bit machine runs only milkyway@home. Both machines are running without problems. Thought you might like some good news for a change. Thanks for the update. Good to hear when people are having a smooth time running the project. My Milkyway@home isn't fetching any more work? Message 63902 - Posted: 5 Sep 2015, 5:35:28 UTC - in response to Message 63901.